Whatever it is whenever you see cookies, smell cookies or even hear of the word cookies, Cookie Monster shall be there. Aha! 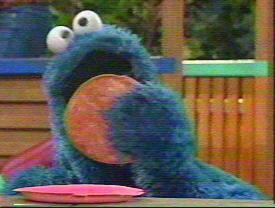 Cookie Monster caught in the act! Caught in the act II !! Cookie Monster having a wonderful time! Cookie Monster's birthday gift! Just what he wished for! Ernie showing Cookie Monster his cookie jar. Beware Ernie! Someone's eyeing your cookie jar! Telly tempting Cookie Monster with the plate of cookies! Here's Cookie Monster's Christmas present. Can you guess what is it? Back for more pictures and links!